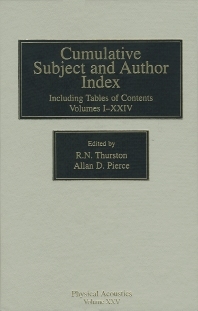 Subject and Author Cumulative Index, Volumes 123. This twenty-fourth volume of the long-running Physical Acoustics series provides a subject and author cumulative index and tables of contents for all previous volumes for easy reference. Researchers in physical acoustics and applications; researchers and advanced graduate students in solid state physics and materials science; engineers conducting acoustics and ultrasonics research.